Two activities will be held in the Reading Room during Expozine : MAINMISE Round-table and discussion, Saturday Nov. 24 15h – 16:30, and Épique Voices: Bilingual readering, Sunday from 15h – 16h! Expozine takes place at 1025 Bélanger (Église Saint-Arsène), Jean-Talon métro, accessible. 11 am – 6 pm. Free admission! You can join its Facebook event here! 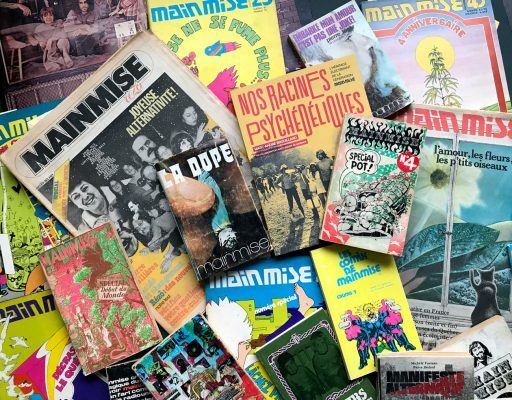 Expozine and ARCMTL are honoured to present a discussion with Bruno Boutet and Rolland Vallée about the legendary countercultural magazine they were a part of, Mainmise, the ultimate resource and reference for underground Montreal and Quebec during the 70’s. Mainmise has since continued to inspire whole generations of publishers, authors and artists. This discussion will focus on Mainmise’s influence on the independent publishing community. Bruno Boutet and Rolland Vallée will bring us back to a long-lost era well before the Internet or desktop publishing software to discuss how they put together each issue, from typesetting, layout, printing, production and distribution. The discussion will be moderated by Louis Rastelli, co-founder of Expozine and publisher of his own noted counter-cultural magazine Fish Piss in the 1990s. The author of Nos Racines Psychédéliques, Marc-André Brouillard, will also be on hand, and the discussion will be followed by a book signing. Not to be missed! Expozine‘s sister project the distroboto machine vending network! Who was at Expozine 2018?